GC13 and David give thanks for Steven Universe’s 2018 exploits (and some things from after Thanksgiving in 2017). Not only was a very big question answered, but smaller questions were answered. Back among the big questions, we also know at least the appearance of all four Diamonds and their Pearls. Plus, Craig of the Creek has started airing, and OK K.O.! has continued going strong. It was a good year not just for Steven Universe, but for its alumni as well. 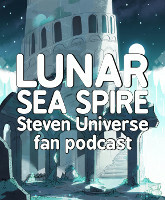 Of course news we are very thankful for broke too late to be included in the episode, and that was the announcement of five new episodes, starting with Legs From Here to Homeworld, airing on Mondays starting on December 17.